GH: Now that the book has been released, what other projects do you have on tap? Are there any plans with Lucasfilm or Disney on future consulting or collaborations that you can share? SS: There are always plans! I’m excited that Lucasfilm has renewed my consulting contract for another year. And we’re going to be spending a lot of time and energy in 2013 making the Rancho Obi-Wan Experience here, as well as our online presence, even more dynamic than it has been. We expect to do a lot more events and maybe even a few Star Wars weddings. The Ultimate Action Figure Collection book took a solid six to seven months of work so I’m taking a bit of a break before tackling another book. GH: You mentioned that the more digital publishing workflow was quite the learning curve for you. How would you have approached this differently or apply the lessons learned on a future book project? SS: As software gets more advanced, there are a lot more things you can do with it—but that doesn’t necessarily mean that certain tasks are easier, quicker, or more efficient. In Photoshop, beside the elements that make up the photo itself, there are lots of data fields that can be used. It makes sense to me that if you’re going to have a few photos in each chapter of a book that you write the captions in one of these so-called metadata fields of the jpeg. But when you’re doing a book that is basically all photos and captions—and you have to have quick access to everything you’ve already written because there are endless checks, changes, and updates—you can’t let the technology overrule the writing. Thankfully my friend and Rancho colleague Anne Neumann developed a custom Filemaker database for captions and photos that let me write the book ; she also figured out a way to transfer the information into the proper data fields of the jpeg. Without that, the book would have been impossible to do—and the workaround added at least six weeks to the time it took to complete the book. GH: What sort of vetting took place to determine which figures qualified? What was the criteria? Dan Curto's mantra is "Count them all." Do you feel you counted them all? SS: I needed to come up with a rough count of figures at the outset so that the publisher would have a good idea of the size of the book. So I spent a lot of time going through online lists—especially those of Rebelscum.com and a few other sites—to start to get an idea. The book’s introduction spells out most of the criteria: straight repacks don’t count; deliberate changes do, but not mistakes that affect only a small part of the run; it’s not a new figure if nothing changes but accessories. Like the Star Wars movies, the book concentrates on characters and how the look of the figures has changed over the years. My initial list was somewhere in the neighborhood of 2,400, give or take a hundred. Dan’s was around the same; although we differed on a lot of specific figures. As we got into the book, and Anne and Paul Harrison also got involved, it was a matter of looking at every single figure to determine if it met our definition of unique. I was flexible and listened a lot, but in the end the final calls were mine, so if someone disagrees with certain figures, they can blame me. GH: This is a "Sophie's Choice" sort of question, but at least for now, out of the 2,500 Star Wars action figures that have been produced over the past 35 years (not counting the customized Hasbro Steve Sansweet action figures over the years), which are your top 3? SS: Actually, there are about 2,300 action figures in the book, but some so similar to others that they’re just mentioned in a caption. I have a warm, fuzzy spot in my heart for the vintage figures, so my vintage double-telescoping lightsaber Luke Skywalker (from the Early Bird package) would be one. Strangely enough, I’d also pick the 1995 ridiculously buff Luke Skywalker figure because it was so wrong and caused quite a stir. When Kenner’s successor Hasbro got back into producing action figures for the first time in nearly a decade, it convinced Lucasfilm that buyers were so used to bulked-up super heroes and muscle dudes in other figure lines that anything else wouldn’t sell. But collectors spoke up loud and clear: they prized movie-accurate over Luke as the Hulk. The third is one that I worked on, the top-secret Commander Jorg Sacul figure for Star Wars Celebration II. I got to name the figure and also wrote the first version of the card back copy. George Lucas as an X-wing pilot was packed with his helmet on to make it even more of a surprise. The head sculpt was amazing! GH: How have your collecting habits changed over the years? Are you a true completist or have you gotten more discerning and selective? SS: There’s only so much time, space, and money! No single person can even know everything that’s out there, much less have the money to buy it and store it. My personal definition of “completist” is that I like every area of Star Wars collecting, from the somewhat tacky to the amazingly beautiful. As the world has changed, so have my collecting habits. Back in the day I made worldwide contacts through writing letters. In the late 1990s, eBay and then online shopping worldwide really widened everyone’s horizons. One thing remains true: I still buy only what I like. The downside of that is that I like nearly everything! GH: There's this little book published in the 90's called The Action Figure Archive which covered Vintage Kenner to Power of the Force 2 action figure toys and also included vehicles, playsets, and packaging. Any plans for a follow up? At this stage, it would be multi-volume publication and one has to question if there's a market for it. SS: Star Wars: The Ultimate Action Figure Collection really is the follow-up to my 1999 Action Figure Archive. That book had 280 figures; the new one has 2,300. So there had to be changes to develop a commercial book that wasn’t three of four volumes and cost $200. That’s just not a mass-market possibility. But with the huge increase in self-publishing and printing on demand, I have little doubt that someday someone will come out with a multi-volume book like that. GH: What are your top 3 collecting moments or memories? 1. The last-second decision to reverse course in 1979 and buy a mint, carded, un-punched vinyl-cape Jawa action figure for what I thought then was an overpriced $45. 2. Saying in an early interview that my Holy Grail was a mint-in-box Return of the Jedi kid’s bicycle that I had passed up at Toys R Us a few years before for $70. Within a week of the article running, I got calls from dealers on the east and west coasts saying they had exactly what I wanted. They both quoted me the same price: $2,000! I passed, but I picked one up years later for a lot less. 3. Getting my first fan-made collectible, sent to my office at the Wall Street Journal in Los Angeles. It was a very imaginative lightsaber, but packed in something that looked so much like a bomb-casing that my admin, who had opened the box, was about to call the cops and evacuate the office. GH: The Rancho Obi-Wan Experience at CVI was such a hit. Are there any plans for other tours or even a museum exhibit? SS: We had a blast at CVI! We were constantly busy and there were always lines, which is my biggest regret. We’re talking to Lucasfilm about doing something at Celebration Europe II next July in Germany. And there’s a whole range of other possibilities we’re starting to explore. GH: Do you have any other passions or interests besides Star Wars? SS: Star Wars and fandom provides enough to fill three lifetimes. But I’ve always been a news junkie, I love meeting and talking to interesting new people, and I really like just chilling with good friends. 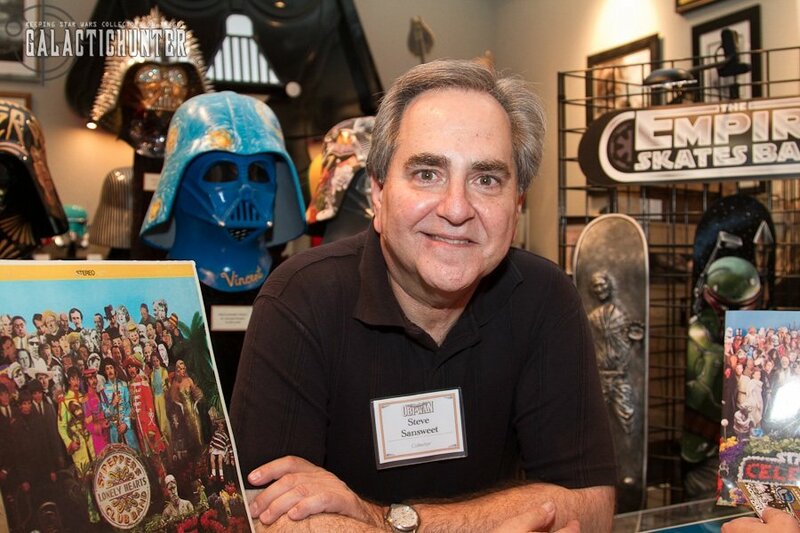 GH: Finally, what are some of Steve Sansweet's words of wisdom or advice for new collectors wanting to jump into collecting Star Wars action figures? SS: It’s what I say to all new collectors: buy what you like! Never buy something because you think it will be a good investment somewhere down the road. If you’re thinking that, so are a lot of others—guaranteeing it will never happen. This is a great time to start buying the wonderful “Vintage Collection” figures, a line that started in 2010. And in just a few years, there will be new figures from the next trilogy. I can’t wait! Read our review of the Ultimate Action Figure Collection by clicking here and make sure to order your copy here and support Steve's Rancho Obi-Wan.